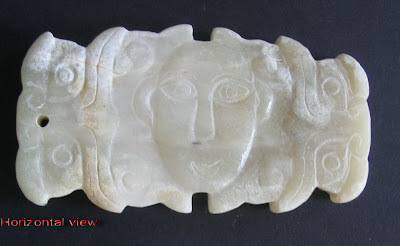 There are three differences between my face bead/pendant and the one shown in Salmony's book. 1. My pendant is pierced at one end only while Salmony's is pierced at both ends. 2. My pendant is flat with identical carvings on both sides while the book example has a plain concave back. 3. 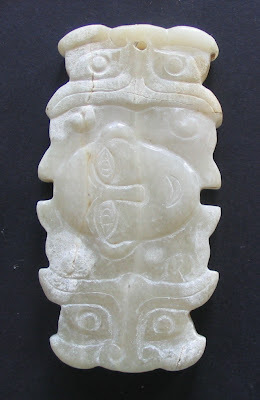 The carving on my pendant is less stylised and dramatic than the book example. Bearing all these differences in mind can my face pendant claim relationship and similar vintage, ie middle Zhou around 1027-771 BC ? Well, vintage considerations aside, it is still a real neat bead/pendant that intrigues.